He is a famous English illusionist, mentalist painter and skeptic. Some people have heard about the Derren Brown mind tricks. Some blame him that he uses neuro-linguistic programming and that is why the people do and say what he wants them to. Some say that he is a genius in flesh and he is to be praised. There are so many talks on his personality that it is actually difficult to cling to either of the opinions. He is famous and famous in our modern understanding equals to rich. So, yes, rich and famous. But he likes not only to impress people. He likes to prove himself that he can do more, way more than he does now. So, one of his tricks or experiments, or whatever you want to call it was connected with the casino. Let us question ourselves: would I like to lose Â£5000 less than in a minute? Or would I like to win 35 to 1 by betting Â£5000 at once, which would make Â£175,000? It is a difficult question, right? Well, it is because some of us do not have that much money to spend at once and others simply do not believe in luck, especially if it concerns the roulette game. That is the reason why Derren Brown somehow convinced a random guy to "invest" the money into that risky venture. It took him a while but he succeeded and got Â£5000, which is really weird. So, he has Â£5000 and is ready to go to bet. And it was not done just because; it was done to make a show out of it. The Channel 4 was shooting everything from beginning to the end. And there it was. Derren Brown entered a casino and headed to the roulette table. 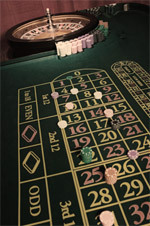 We all know that the roulette game is a game of chance. Nothing legal can influence the result of a single spin. He took the cash, converted into the chips and wagered on number 8. The saddest thing that happened was that "8 black" is a neighboring pocket to "30 red." And the ball landed on the number 30. That is life. Later there were suppositions that there was a truck with number 30 on it near the shooting team and so on and so forth. People start speculating, what it concerns the numbers. Or as we say, it almost hit the target). But the core word is not "hit," but "almost" and as we know - almost changes nothing.